Compositech Drum Filter drainage grids are designed to offer superior flow in almost every drum filter application. Our Hi-Flow Drainage Grid features a wide open drainage pattern providing optimal flow characteristics without sacrificing filter cloth support. Our grids have approximately 90% open area on the back of the cloth. With tapered openings, the true open area of the grid is 65%, the highest in the industry! 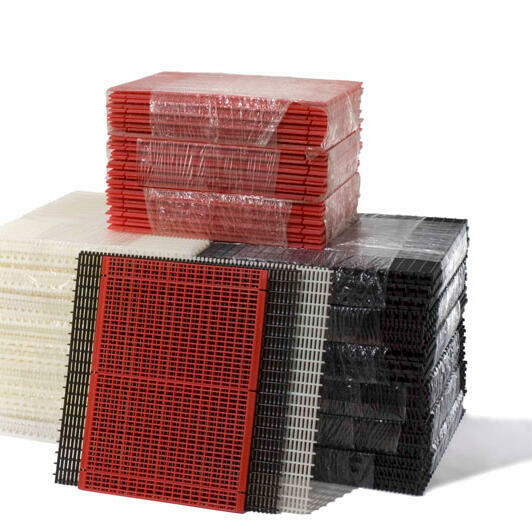 Compositech grids are high pressure injection molded from engineering grade polypropylene. This material translates to greater service life making our grids the premier product for replacement of any O.E.M. drainage grid. Whether you operate an Alar, Ametek, Dorr-Oliver®, Eimco®, Komline-Sanderson, Peterson, Westech or any other rotary drum filter, Compositech Hi-Flow Drainage Grids are available for your filter. The drum surface is divided into several sections using plain or perforated wing division strips welded to the drum shell. The division strips hold the grids in place on the drum. The grids are ready for direct installation under the division strips or they may be notched to install flush with the division strips for scraper discharge filters. We precut and notch grids for our customers so the grids can simply be slipped into place. We also bond grids together to make larger panels. We have customers who use our grids bonded into panels up to 78" long. Compositech offers the only full line of grids and grid preparation services available to all drum filter users. Our grids are generally cut and notched to customer specification and available for shipment within 48 hours of your order. Full un-cut grids in standard thicknesses can be shipped the same day your order is placed.